Live bait is the way to go if you are ice fishing for sunfish, but there are a wide range of choices when it comes to winter baits and figuring out which baits work best can be confusing. If you are fishing for bluegills or other varieties of sunfish this winter, here is a guide highlighting six live baits that will help you catch more fish. Anyone who regularly fishes for sunfish though the ice should carry wax worms. These little larvae, which are from the bee moth, are a sunfish favorite. They are larger than many other larvae available for bait, with a body of about 1 inch in length. Fished alone on a size 8-10 hook or with a jig, wax worms produce all winter long. Similar in appearance to wax worms, spikes are a bit smaller, but work well for sunfish. They are the larval form (maggot) of the bluebottle fly. The body of a spike is a bit tougher than that of a wax worm, which helps keep them on your hook longer. Spikes work well with a bare hook or fished with a jig. This is another type of maggot that works especially well for sunfish. They can come in a variety of colors, which can be helpful, especially when other live bait options do not seem to be working. Like spikes, eurolarvae are a bit smaller than wax worms, but that does not affect their attraction to sunfish. Eurolarvae can be fished on bare hook, but seem to work better with a jig. While the above larvae are quite similar in appearance, mousees offer different twist, because they have a tail. They can be more difficult to find, because they are harder to harvest, but if you can find them, they are definitely worth trying. The added look of the tail can be a real attractor that can help you catch more sunfish, especially when other baits are not working well. Although they are more popular during spring and summer, mealworms are very effective for sunfish. They have a large size and sunfish seem to love them. The one downside to mealworms is that they seem to die more quickly in cold weather than other larvae baits. Try them on warmer days when the air temperature is near or above freezing. 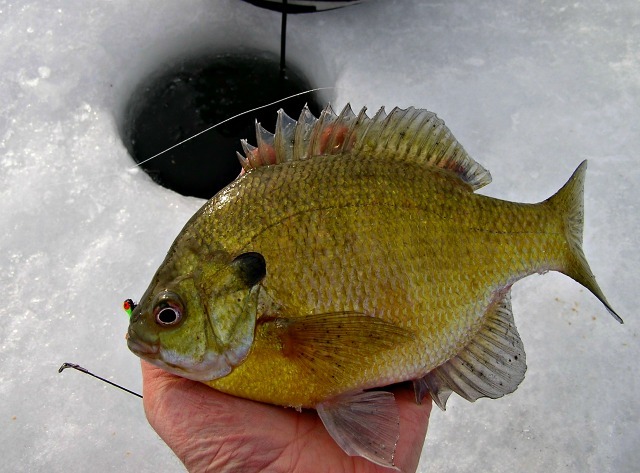 While minnows are typically not a go-to bait when it comes to ice fishing for sunfish, they can be effective. Use small crappie minnows or cut the head off a minnow and add it to a jig. You are not likely to catch as many sunfish with minnows, when compared to larvae, but in some cases minnow will attract larger sunfish. Minnows can be used with a bare hook or jig, but if you are using just a portion of a minnow, a jig is a better choice.